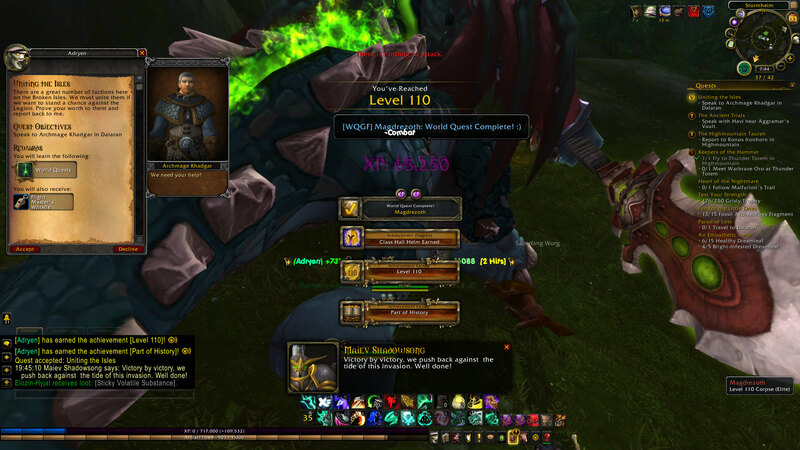 So the goal of getting all twelve classes to max level is complete. Thanks to two or three invasions over the last week, the last two are done. The eleventh was Adryen the monk. And last we have my demon hunter, Feorn the Fabulous. The twelve are split evenly, six Alliance, six Horde … although I wasn’t quite organized enough to split them further by armor type, as all of my clothies are Horde and all of my plate wearers are Alliance. Meh, whatever. 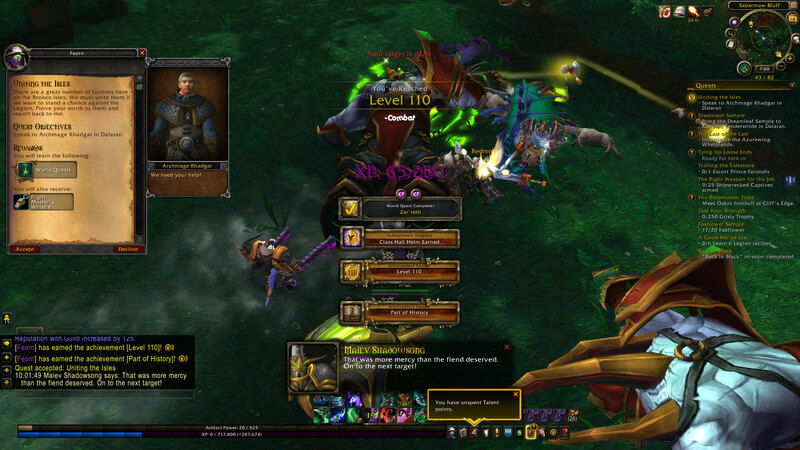 At least I also got the tailors on Horde with the clothies and the BS on Alliance with the plate wearers. Sorry Horde, the LW is on Alliance. Maybe when I’m bored (wait, when is that??) I’ll send some of the duplicate class alts to the invasions to remedy that situation. Next goal is to finish all of the class campaigns, followed by all of the class mounts. I’ve finished like half of the campaigns so far? No, seven. I’ve gotten four of the mounts, although I have two more that are on the final quest/scenario to get theirs. The last of the seven just needs to collect sentinax marks which I am really lazy about because boooooooooring. The other five are recently leveled and still working on the gear they need to do the heroic dungeons in their class campaigns. Yes, yes, I could do normal, but the queues for normal are usually longer. And it only takes a few carefully chosen WQs and whatever unsullied gear Kerick finds to get them up to 825. It’s really not difficult. Side goal for Oranis the mage, as mentioned last week, is all of the Legion fishing reps, most of which I plan to do on Sundays while I watch football. Yesterday I did the one in Azsuna since that is who was up. Thankfully, these take MUCH less time than Conjurer Margoss did, mainly because the things that you fish up can be 3-4 at a time instead of only 1-2 like his are. In just about 2 hours, give or take 10 minutes, I was done.